20111125 + Up in the am and all the boys out with Gma&paW on high adventures. L&I headed out to brave the shopping throngs... Not bad this year, stores were not packed and we got out shopping done in good time, putting the stores in the black but us in the red... Our wait for lunch took longer than the store lines. We had an awesome lunch at Red Lobster, then back to the farm. 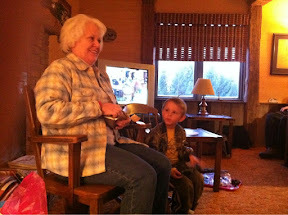 L&I got the car packed and everyone got home with their treasures... We had a bday party for GmaW before heading home. We got home to see the end of the Gahanna Lights parade from the back porch and Lilly was crying she was so happy to see us. Everyone cleaned up and we watched the new 'Spy Kids'.